trash: You and the Runner secretly spend 0credit, 1credit, or 2credit. Reveal spent credits. If you and the Runner spent a different number of credits, resolve 1 subroutine on a rezzed piece of ice protecting this server. Use this ability only during a run on this server. The Flare that burns twice as bright burns half as long - and you have burned so very, very brightly, Marcus. The 1980s weren't nearly as good as everyone thinks, although they were certainly better than the '90s. Nothing went right in the '90s outside of the birth of CCGs and the golden age of Sportcenter. Like everyone else I ushered in the new millennium a year early just to be grateful to flush away a grungy, ten year old flannel-wrapped, turd. If you're not old and grumpy like I am, you may not be aware of just how massive of an Easter egg Marcus Batty is. You probably won't care - which is fine because everyone gets sick of old people telling them in one breath how easy they have it at the same time as saying how much better things used to be. Not only is he the sort of card that makes you immediately do a t:ICE search just to see how much evil you can pull off (66% of the time, it works every time!) 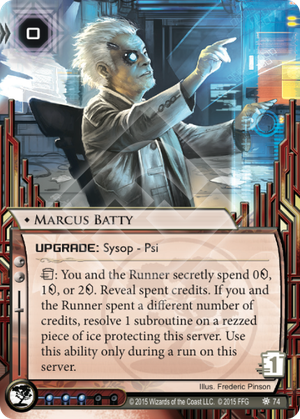 but he happens to share the surname with Roy "I want more life, fucker" Batty from Blade Runner WHILE being a direct call back to Dr Dreff, a sysop upgrade in the original Netrunner CCG. Dreff himself was a call back to Dr Emmett Brown of the Back to the Future franchise (still leeching money from Gen X pockets today! ), who was in turn a call back to Albert Einstein. That's three layers of call back regression in one great, great card. Lastly if I'm not mistaken our good man Batty bears more than a passing resemblance to John "Cyrus the Virus" Malkovich. I may be reaching with that though. The best and funnest card in a little while for me. Until Turbeau Delacroix v2 comes out with Data and Destiny at least. I know you're in there! Those are what come to mind but the potential with Batty is pretty crazy. Depending on your deck's needs, there's probably a killer subroutine that makes winning easy (think Data Raven or Gutenberg in Butchershop, Taurus in any Scorched Earth build) & Batty gives you an ≈67% chance of landing it no matter the opponent's icebreakers. Dreams of brutal subroutines aside, Batty is also a solid Ash 2X3ZB9CY replacement in glacier decks. I'd expect Replicating Perfection players to save 2-4 influence by resorting to Batty. There are some interesting timing issues with Batty too that I haven't had a chance to fully experience in my few games with him. You can fire his ability during any window, unlike Caprice, so the only holdup is ensuring you get your target ICE rezzed first. In glacier builds where Batty is used for an ETR, he'll function much like Caprice & be triggered after the last ICE is passed. But I can imagine scenarios wherein a runner anticipates a Batty kill & jacks out before you have a chance to fire. There are also probably many edge case scenarios where you'll want to trigger him because of ICE placements, e.g. to trigger a Gutenberg in front of Universal Connectivity Fee, a Chum in front of Neural Katana, etc. Is Batty broken? Are we all sick of Psi Games? IMO, Batty is actually more balanced than Caprice Nisei. The one-shot nature combined with the ICE rezzed limitation makes it much harder to get value out of him. That said, his upside is enormous & will only continue to climb as more fearsome ICE is released. With a rez cost of 0, you can even circumvent Drive By or anticipate Hacktivist Meeting simply by installing him rezzed. This card is way too strong. I really feel this card broke Netrunner. Him paired with Archer will end the game 66% of the time if both players have credits. Even if you play the best Netrunner game of your life; if the corp has 2 credits and a scored agenda, if you guess wrong, they blow up your sentry breaker, you then run into Archer and lose your other two breakers. Any thoughts on this please post them in the comments.